I usually don't take photos of the rough gem material. However, because I had a few questions about what it looks like before it is faceted, I did remember one day to get some pictures of parcels I had recently acquired. 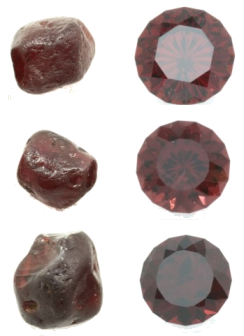 Now that I have cut some of those pieces, I have a group of "before" and "after" pictures of few garnets. Obviously in these photos, the scale is not consistent. However, you can see some typical rough garnet and what was done with it. Most of the garnet rough I have encountered is similar to water worn pebbles rather than a nice geometric crystal. In some cases, a very fine saw may be used to split the material or remove excess material. However, the bulk of the faceting work is done by grinding off the excess to create each facet of the gem. The faceting process involves first removing flaws in the material and shaping the stone with a coarse grit. Then with a finer grit, each of the facets is cut. Often a very fine grit is used to produce a "prepolish" on the facets. Then each facet is polished with an extremely fine grit or an oxide to produce essentially a mirror finish. It is not unusual for two thirds or more of the original rough material to end up as sludge in the bottom of the splash pan of the faceting machine. Most faceters in the US try to do precision cutting -- angles chosen are to maximize the light return and all facets properly shaped meeting its neighbors exactly according to a predetermined pattern. Another approach to faceting is what is often labeled "native cut". In that case, the material is cut to maximize the weight of the finished stone, often at the expense of the brilliance. The facets on native cut stones also tend not to meet nicely, they are misshaped and do not line up with each other. One other major difference between "native cut" and precision cut, is the polish. The short version: Like a number of others who enjoy turning rough into sparkling gemstones, I have found a way to give something back to one of the areas where the gem rough originates. 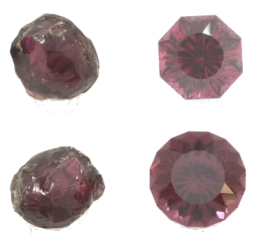 All the money from the sale of the Malawi garnets I have cut will go to the K.I.N.D. fund to provide scholarships for Malawian girls' high school education. See http://www.msnbc.com/the-last-word/introducing-the-kind for the background on the fund. I have had a soft spot for garnets since I started faceting. Perhaps it is because they cooperated in the polishing stage better than many other types of material. Or maybe it is because the material I had was the common red variety of garnet and red goes well with my favorite color, green, to make the traditional Christmas colors. Probably it is because when I was very young my mother told me that garnet was her birthstone -- and she never had a real garnet. The second factor in picking this project has been that education has been a huge part of my life. My dad found his vocation as an educator. For a number of years my mother worked as a secretary in an elementary school. And when circumstances allowed her to obtain her college degree, she became a special education teacher. A great many of our family friends were folks they knew from the schools where they worked. Furthermore, the importance of education for girls is something with which I had much personal experience. As a female baby boom child, the world I found had many doors closed for girls. It was just assumed that after high school girls would get some clerical job, or perhaps enter nursing or teach elementary school children or work in a retail store. And generally that career was going to be just long enough to land a husband. Even recreation focused on the boys. Our neighborhood had little league baseball games for the boys all summer long. There was no sports in the community for girls. Because my parents cared so much for the value of education and were willing and able to make the sacrifice needed for the tuition, I went to a private school. There I was exposed to much more than what would have been the case for the girls who went to the local schools. That led to the high school experience and eventual college degree -- an opportunity that many of the girls of my generation never had. I cannot imagine how different my life would have been without the education I was lucky to have received. The third piece in this project was the Lawrence O’Donnell show on MSNBC. Around the holidays he talked about his experiences in Malawi and the K.I.N.D. fund. The lack of opportunity for girls to get even a high school education is something that would likely keep them and their future families in poverty. Those stories and the images of the young girls stuck with me. 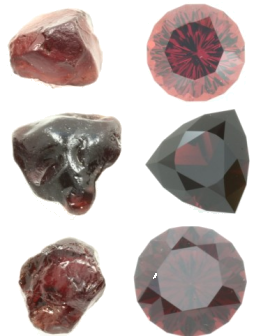 Thus when I came upon a rough dealer's page of garnets with many from Malawi, the pieces came together. All money from the sales of gems I facet from Malawi garnet rough will go to the K.I.N.D. scholarships for the Malawi girls.